These chocolatey little truffles are a very low on effort and very high on reward. Super easy to make, a little bit messy and very yummy. 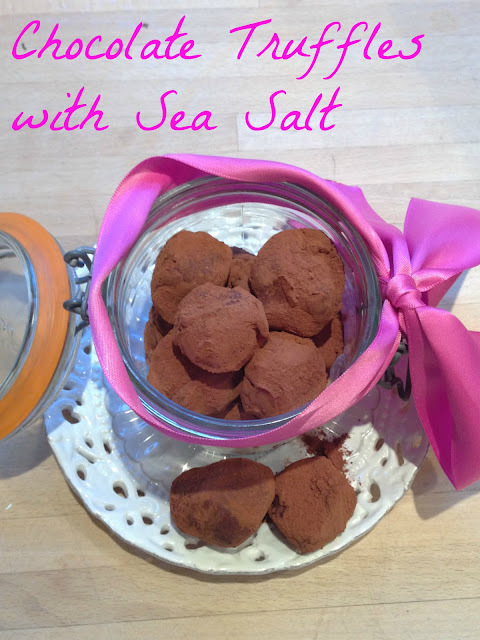 Their intense chocolate sweetness is offset and increased by sea salt which adds a little je ne sais quoi to an otherwise simple classic. They keep for a week in the fridge and the best thing is the basic recipe (minus the sea salt) can be adapted to your tastes entirely. I could eat salted chocolate all day long, but a drop of peppermint as an after dinner treat or very finely grated orange for christmas would be equally as delicious. They can also be made with white or milk chocolate, although dark is by far the best, and it does need to be the best quality you can afford. Break the chocolate into small pieces, and put it in a large mixing bowl. Put a saucepan over a medium heat, add the cream and bring to a rolling boil. Add the sea salt, stir, and immediately pour the hot cream over the chocolate. Stir well until all the chocolate is melted and smooth. Leave the mixture to set at room temperature for at least two hours depending on the room temperature. Use a dessert spoon to scoop out some mixture when it has set in the bowl. Dust your hands with cocoa powder to prevent the truffles from sticking and roll them into balls in a plate of cocoa. This can get quite messy, just keep covering your fingers in cocoa powder. Lay on a tray covered in greaseproof paper and keep in an airtight container in the fridge. Whoever first paired up chocolate and sea salt is a genius.